After HART crossed the finish line first in the 2013 Continental Tire Sports Car Challenge event at Kansas Speedway, the celebration was short-lived, as the Race Director handed the team a 10-spot penalty for “manipulating the restart” on the final lap. The team appealed the penalty, but ultimately had to go home in 11th position after fighting so hard throughout the race. For 2014, the team still had high hopes but cautiously approached the event, as it would be battling against the new Porsche Cayman and anything could happen. The Kansas schedule would be unlike any other schedule this year. There would be two, one-hour practice sessions running into the evening on Friday and qualifying would not take place until 9:15pm. With a busy day and a late night ahead, the team prepared for the worst (and it’s a good thing they did). Both cars headed on track for the first practice with strong hopes of running up front. Michael Valiante was able to place the #93 car at the top of the list before pitting, while the #92 was getting up to pace since Steve Eich and Kevin Boehm had little time on the Kansas circuit. As Chad Gilsinger started his first stint behind the wheel in the #93, he managed to run only two laps before the clutch disk broke. At almost the exact same time, the #92 had a drive shaft failure. Both cars were able to make it back to the paddock and the team went to work. With only a few hours in between sessions, the crew had its work cut out to perform the necessary repairs. Luckily, the HART crew is one of the best in the paddock and did not panic. They simply got the job done. Both cars would be ready for the second practice and the team still needed to gather valuable data on both setups and the new brake package which had been provided by HPD. As both cars hit the track, the #93 quickly had a problem. The transmission would permit gear changes, but the gates were very “notchy,” making it difficult to change gears quickly. Gilsinger brought the car in immediately so the crew could diagnose the problem, as qualifying was only a couple hours away. Meanwhile, the #92 car was providing valuable data for the team and its drivers were gaining needed experience on track. Crew chief Andrew Salzano was also running calculations on fuel mileage to use for race strategy. With the session winding down, the #92 once again started having drive shaft problems and the 4th gear of the transmission was starting to feel weak. As qualifying approached, the team was working diligently trying to get both cars prepared. The #93 was found to have the wrong pressure plate/clutch disk pairing, so the team had to pull the transmission one more time for repairs. For #92, the team worked to build new drive shafts, but decided to wait to change the transmission until after qualifying. In order to better understand the drive shaft concerns, the team installed a GoPro camera on the subframe and pointed it towards the drive shaft to see what was happening. This would give the team a “real time” visual on the car and would hopefully indicate the cause of the failure. At Kansas, the draft is worth up to two seconds in lap time so it is crucial to pair up with someone in qualifying. Luckily, HART runs a multi-car team and the plan for #92 and #93 was to work together to provide each other a draft. With all the repairs that were needed, the #92 car was not quite finished when the cars went to grid. This left #93 without a “wingman” and would make things more challenging. As the cars rolled onto the track, the #93 tried to pair up with one of the Porsches that had demonstrated good pace earlier. Unfortunately, the Porsche overshot Turn One starting its first hot lap and cost #93 valuable time. The #92 was able to make it on track and was searching for a drafting partner. With both cars having radio communication, Eich and Gilsinger planned a method to get both cars a good lap. As time was winding down, Eich was able to get a good draft off of the CRG Civic Si and #93 and posted a lap time that put it in the top five. Gilsinger was still struggling trying to find a draft, so Eich put himself in a position to help. On the last lap, Gilsinger was able to get a small draft off #92 and bettered his time to take the sixth position. As qualifying came to an end, Gilsinger managed to hold onto sixth, while Eich was bumped back to seventh. All in all, it was a great ending to a disastrous day. After a wild Friday, the team had some time to rest on Saturday, since the race would not start until 6:15 p.m. and would end under the lights. Steve Eich would start the #92 car and Chad Gilsinger started the #93. Even though the race was late, the team had plenty to prepare for. The #92 still needed a transmission and the drive shaft failure was still a concern. The team analyzed the GoPro video and it seemed that the failure was occurring when the car was loaded up on the banking. To reduce some of this compression and angle on the drive shafts, the team decided to stiffen up the front of the car by adding higher-rated H&R springs. Once again, the team did an amazing job and had both cars cleaned and ready for the Fan Walk before the race. This would be the first time the cars could start near each other. The goal of the drivers was to work together and work their way into the top five. The team knew it had a tough battle, as four of the top five cars we new Porsche Caymans. As the green flag flew, Gilsinger had a great run going into Turn One and was able to move into fourth place. Meanwhile, Eich lost a couple spots because the car in front of him was “sleeping” at the start and he was not allowed to pass until crossing the start/finish line. With this race taking place on a smaller road course inside an oval, there were not many corners, so the anticipation of yellows was low. Eich was able to battle back up to fifth position and Gilsinger was able to stay in fourth after the first hour of the event. Seeing that a yellow flag condition was unlikely, Andrew Salzano formulated a strategy to pit both cars under green as their pit windows opened. Both were able to open up a bit of a gap to the cars behind them and this would give them an advantage. Once again, the team did an amazing job in the pits and both cars were serviced and out without losing any time. As the first round of pit stops came to a close HART found itself sitting in second place for #93 and seventh place for #92, with Valiante and Boehm, respectively, now at the wheel. With about an hour left, the final caution period of the race was ending and Valiante was ready to move to the front. 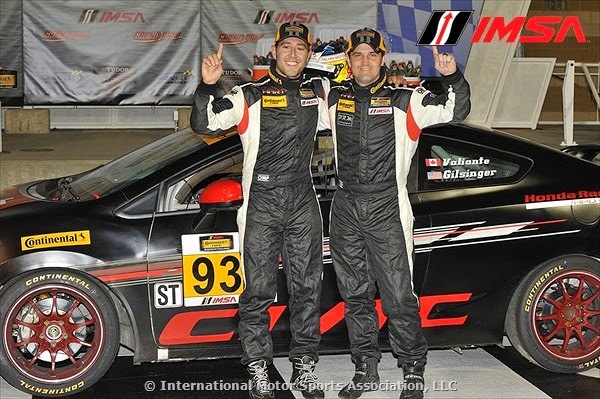 As the track went green, Valiante took his Honda into the lead, passing Charles Espenlaub in the Porsche Cayman, which had started from the ST pole. At the same time, another Cayman was moving through the field and putting major pressure on Valiante. The two battled back and forth and even made periodic contact. It was a true nail-biter, but in the end Valiante and Gilsinger came out ahead in a tough battle with the Porsche Cayman of Will and Wayne Nonnamaker. 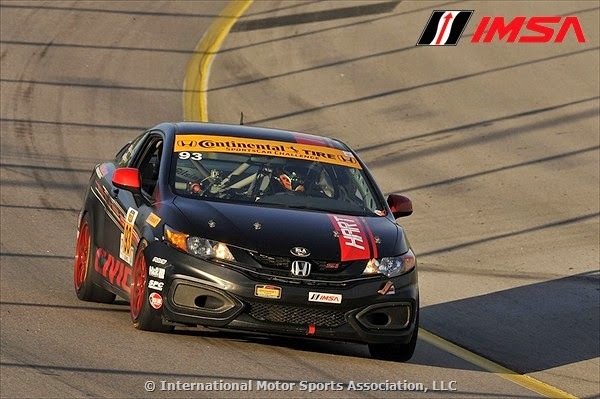 The Honda edged the Nonnamaker Porsche by just 79 one-hundredths of a second at the checkers. Unfortunately, the #92 once again had a drive shaft failure which forced Boehm to retire the car. "This was one of the toughest wins I've had, with that much pressure and knowing that second and third [places] were coming," said Valiante. "I knew I couldn't make any mistakes, particularly when they were on my bumper. I kept telling myself, 'Hit your marks … hit your marks' and get good exit shots, and I was able to pull it off. That's one of the toughest wins I've had. "The team finally got the “monkey off its back” and hopes to see the season turn around as it heads to Watkins Glen at the end of the month, a track where the team has seen victory before. The Kansas race will not be televised, but watch for upcoming events on Fox Sports 1. The next Continental Tire Sports Car Challenge event will be at Watkins Glen, June 27-28. Special thanks to all our Sponsors/Partners.